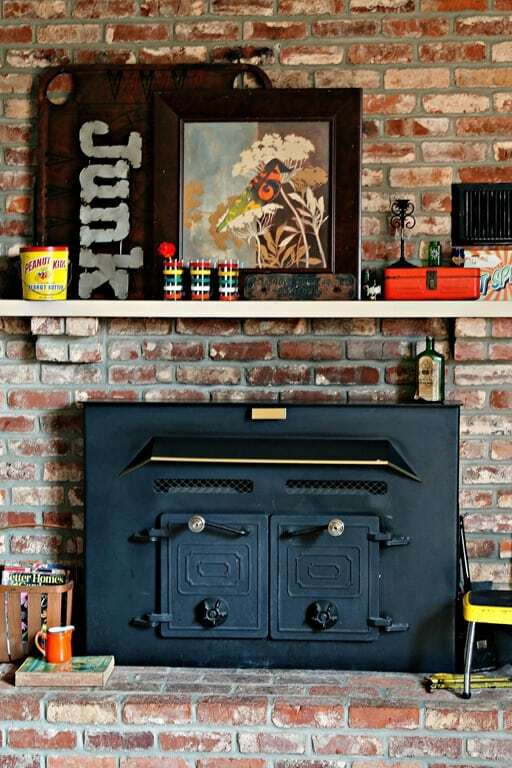 Your mantel makeover doesn’t have to break the bank. You can get mantel decorating ideas by shopping your home. Showcase a favorite item. 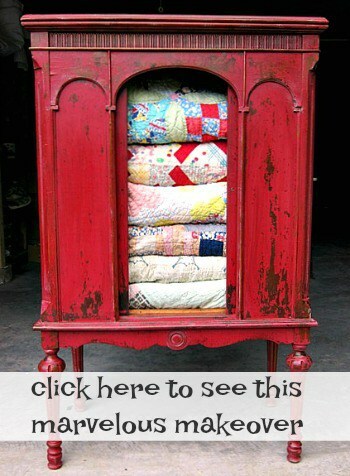 When you bring home a thrifty find or something new for your home do you automatically incorporate it in your home décor? When I bring my finds home they get dropped in the back bedroom or on the hearth……depending on where I think they might eventually be used in the house. Most of the stuff ends up on the hearth because that’s the closest spot to the door. Yeah, it tends to be a catchall for my latest junk finds and other stuff. **Don’t have a mantel? Don’t need one. These tips and tricks work for decorating anything……wall shelves, bookcases, china cabinets, you name it. Last week I found two fun items at one of the shops where I have a booth. The vendor was having a 35% off sale and I had been eyeballing an orange metal box every time I passed the booth. You guys know I’m a sucker for orange. So I bought the metal box and a framed print. The framed print was a bit different. It had a cut out paper bird attached to the middle of the print with a silver fastener of some type and the print was under glass. It may have originally had the bird in it because it’s just decorative wall décor probably from Kirkland’s or a similar store. Anyway, the bird had a bit of orange on it and I was sold. The two items were originally $5 each so the combined cost after discount was a grand total of $6.50. Not too bad. I brought them home and dropped them on the hearth. That’s when I decided to change up the mantel décor using the two new finds as inspiration. Of course, it was a week or so before I got around to decorating the mantel. 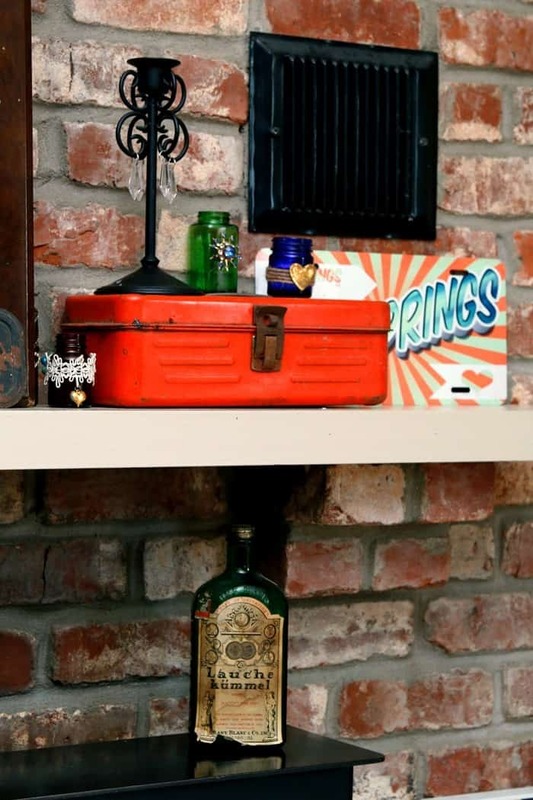 I’ve talked before about shopping your house, garage, etc., for things to add to your mantel décor. Usually I have a focal point piece I’m starting with and that is where my color scheme comes from. In this case the color was orange…..which led me to greens, yellows, and even reds for the new mantel decor. With those colors in mind I shopped the house. 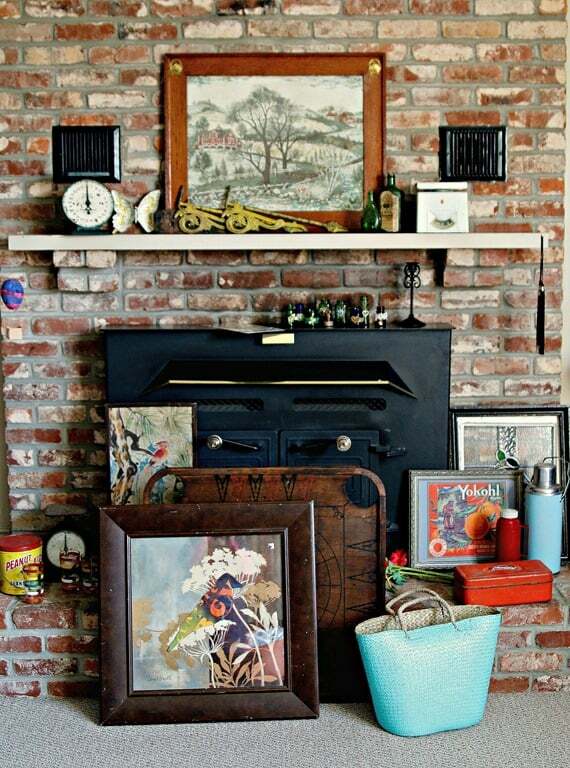 You can see how the mantel looked before makeover in the photo above and also the things I gathered sitting on the hearth and floor.Some items I used, some I didn’t, and I had to search for more stuff during the decorating process. It’s mostly trial and error to see what works. This is how the mantel and hearth look now. As you can see I’m not really into symmetrical décor. But you probably know that if you’ve been here for a while. I used an old game board as a backdrop for the picture. I like using old shutters or something similar to the game board because the brick is so busy. It needs something to break it up. Yep, the orange metal box with handle is my $3.25 purchase. I picked up the Hot Springs license plate at a thrift shop in Hot Springs, Arkansas. The hubby and I were married in Hot Springs! 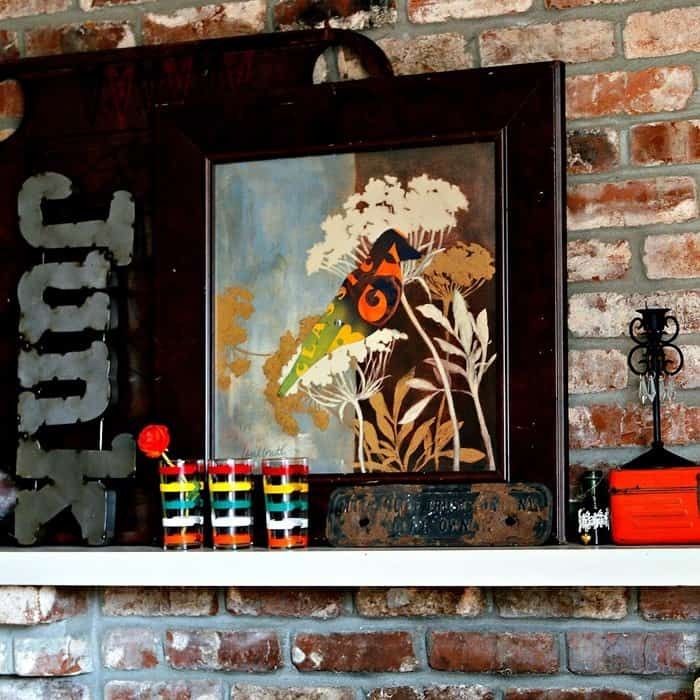 The JUNK sign came from a flea market in Pigeon Forge. I needed something with height to fill the place next to the framed print and I couldn’t find anything else. Vertical JUNK. I used a few of my Bling Bottles in the display too. I got the yellow Peanut Butter bucket at my favorite junk shop. The long floral painted piece came from a flea market shop a long time ago. The vintage yellow Cosco stool is one I bought at an auction not long ago. I think I paid $5 or $6 for it. The yellow metal pieces are from my favorite junk shop and you guys are the ones who told me what they are because I had no clue……vintage swing arm cast iron curtain rods, missing the hanging brackets. Ya’ll, I am seriously in love with these glasses. I bought them at an auction last week. I believe I paid $4 for the three. You can see I use items in my decorating that maybe aren’t meant to be decor. I say use things you love…….always…..and make it work. Here you get a better look at the Bling Bottles and also an old liquor bottle I found at my fav junk shop. I bought the black candle holder new many, many years ago. I found the basket at a local flea market and it held a set of red picnic plates and cups. 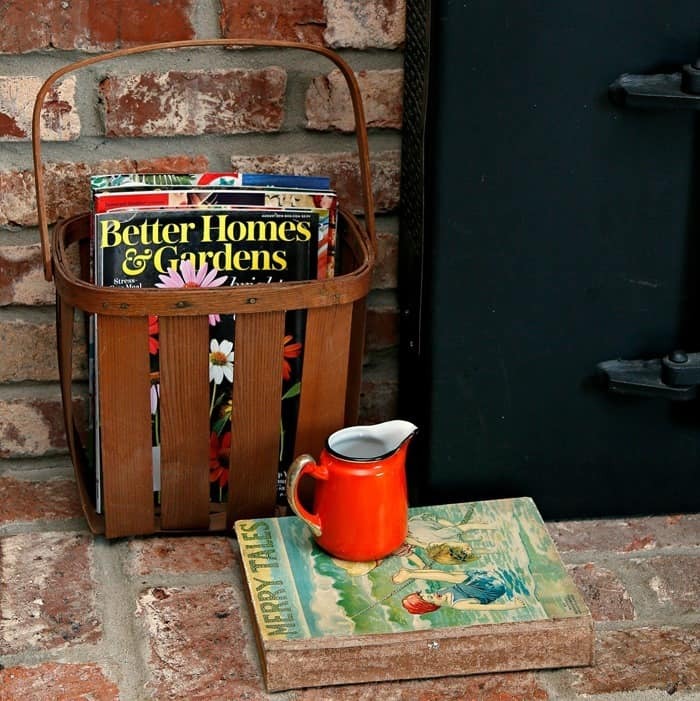 I planned to paint the basket but I like it as is as a magazine holder. The orange creamer has a floral design on the other side and I bought it for $1 at the Nashville Flea Market. The book I’ve had forever and I bought it because of the colors. Shop your home when decorating and use items in a unique way……like I did with the drink glasses, or the picnic basket, or vertical JUNK. All of these things except for the 2 latest thrifty purchases are things I had at home. 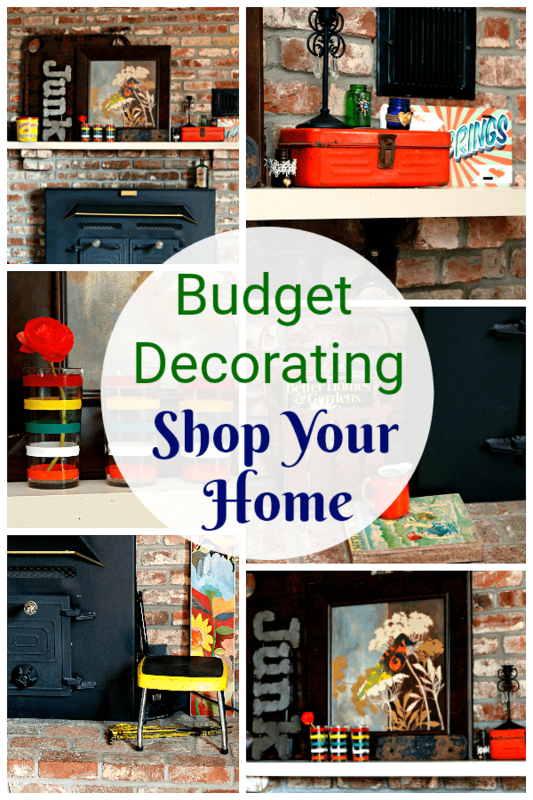 No need to go out and spend a bunch of money when decorating. 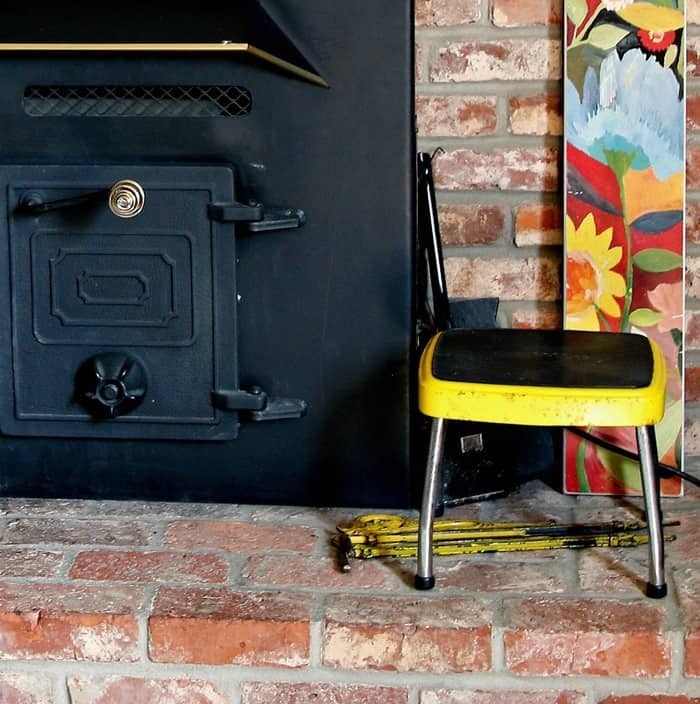 All of the things on the mantel and hearth are things I love and they make me smile. I made over the mantel last week and every time I walk in the room it still brings a smile to my face. Other mantel makeovers of mine you might like are…….the Flamingo Mantel featuring a tennis racket …….and………Mantel Décor Featuring Architectural pieces and Frames. My mom had striped glasses like those on your mantel. 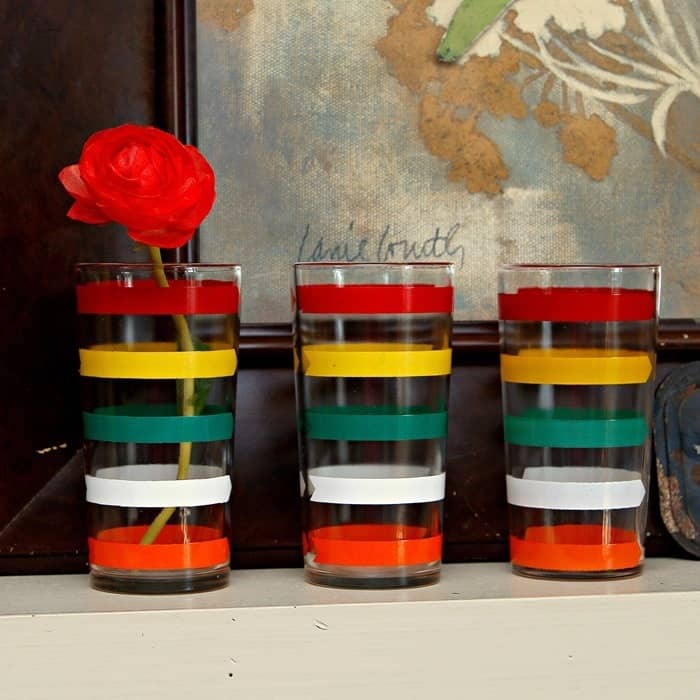 We drank out of “glass tumblers” all the time – no Tupperware nor Tervis back then (50s/60s!) I later became a Tupperware dealer, though. Your post recalls a lot of good memories! 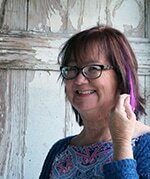 Hi, SharonFromMichigan! I’m NaomiFromMichigan! The mid-lower peninsula. Wonder how many of us Michiganders love Kathy’s blog. We might form a group–the Michigan Contingent! Now, to you, Kathy! What a fun post. I used to love orange and then I sort of got away from it. I haven’t decorated with it for years but I love seeing it in your mantle decor. I want a mantle in the worst way. I don’t even have a fireplace but I want a mantle so I can have a place to decorate that the kids and the cats aren’t likely to mess with. But I don’t like those modern fireplaces with mantles they sell at the big box stores because they aren’t high enough like a real fireplace mantle would be. And I hate the ones that are meant to hold a TV and VCR because they seem so bogus to me. So I just keep hoping that someday….a mantle–a real one–will find me! I think I like the JUNK sign almost the best of all your mantle decor. I would love to have one by my back door! Thanks for sharing your unique eye for mantle decor! Your post made me smile. I always tell my husband to “shop in our basement” before he heads to Lowe’s or some other home improvement store. Its amazing what you can find in your own home without having to go out and bring in more items. Beautiful mantel decorations! Have you ever considered painting or at least doing a white wash on your brick. Also you might build a shiplap back drop. I referred back to some of your previous mantle decorations and they are always dark. 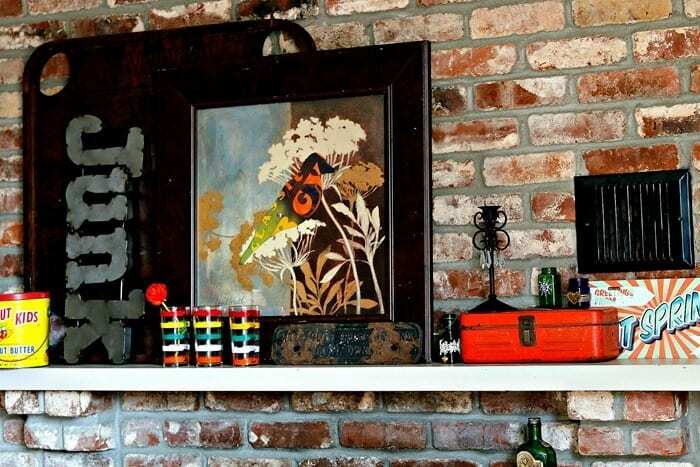 I know you said your room was earth tones, but your mantle needs to be more cheerful for spring. I too had earth tones until I finally,but against my will, took some advice and changed to the gray and white look. I was amazed at the difference it made in brightening up my rooms I still use touches of green,red and yellow for accent because I still love those colors. Just a thought. Don’t ever get rid of that lovely old book – you just can’t get them these days or only very rarely, and it’s such a homely touch. i am crazy about books mind you.